These boxercraft Pom Pom Jersey custom t-shirts are the perfect way to show off your team spirit or while promoting your brand. 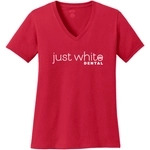 A ladies cut 100% cotton custom t-shirt that is ring-spun for added softness. A vintage wardrobe staple! Stay on trend with this women's heathered Threadfast Triblend Custom T-Shirt! This 4.1 oz. shirt is lightweight and comfortable. Designed for a feminine look, this custom T-shirt is exceptionally smooth thanks to the ComfortSoft cotton. These customized t-shirts are available in a wide variety of color options and feature a form-fitting design just for women! Take on oppponents in ultimate comfort with this Sport-Tek logo shirt. This lightweight custom shirt has a roomy, athletic cut and controls sweat like a champ. A no-frills custom t-shirt in a classic silhouette—with a very friendly price point. Take your brand to the streets with fine jersey printed tank tops with superior screen printing results.